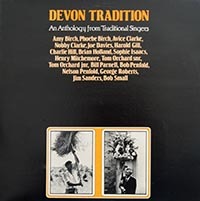 An Antholoqy from Traditional Singers from Devon with Amy Birch, Phoebe Birch, Avice Clarke, Nobby Clarke, Joe Davies, Harold Gill, Charlie Hill, Brian Holland, Sophie Isaacs, Henry Mitchemore, Tom Orchard snr, Tom Orchard jnr, Bill Parnell, Bob Penfold, Nelson Penfold, George Roberts, Jim Sanders and Bob Small. The Rev. S. Baring-Gould, who collected folksongs in the West country during the 1880s, wrote in his reminiscences that “the old fellows who had these songs were fast dying off, and their sons and grandsons despised the ballads and the tunes in the Gregorian modes and sang only the last vulgar music-hall ditties.” Many song hunters from that day to this have thought the same. Are they right? Well, this record of pieces recently collected in Baring-Gouldâ€™s own county of Devon gives some answers.